I recently rediscovered this eyeliner when sorting through my makeup, I came very close to throwing it away but decided against it just in case the opportunity to wear bright blue eyeliner came along, then one day I was feeling a bit bored of wearing my usual neutral eyeshadows, so I decided to try this eyeliner on for a bit of a change. I'm really surprised at how much I love it, I thought it looked a bit too bright, but I feel it does not look over the top, and it really brightens up my dark eyes. It was a very long time ago I bought this, however, I have had a look, and boots do still sell the Barry M liquid liner for £6.99 which I think is great value for the product, however, I am not 100% sure they still do this shade. 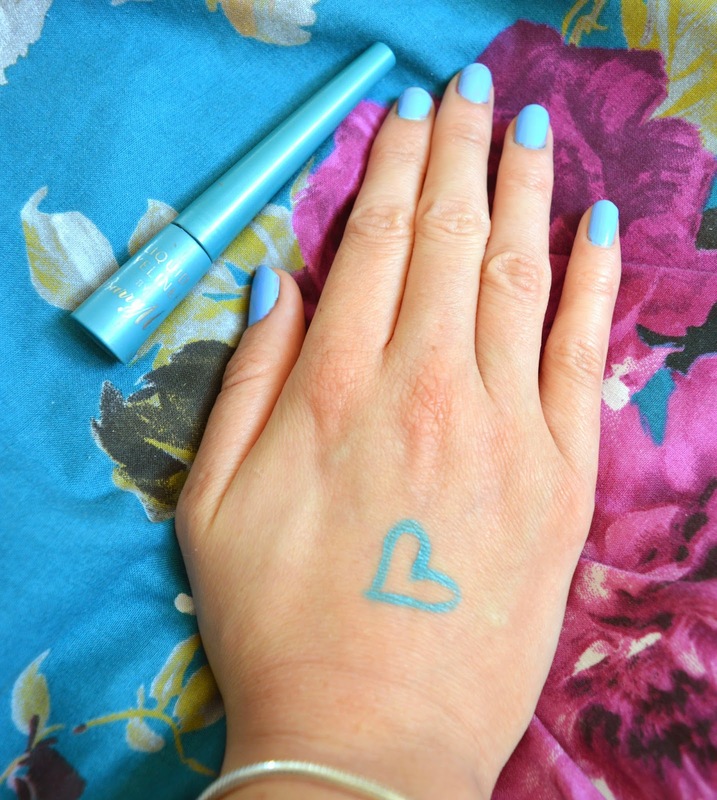 Despite first thinking, this shade would be too bright for everyday wear, I have fallen in love with the vibrant colour, it's a really beautiful shade of blue, which I think looks great with the contrast of my dark eyes. What I love the most about the eyeliner is the staying power. I have a really bad habit of rubbing my eyes, which means usually by the end of the day I have makeup all over my face.. and not in th good way. This eyeliner, however, does not budge, not even slightly, throughout the day, it looks as though I have just applied it, the only eyeliner I have ever found this with. I also find apply this eyeliner is not a struggle, while it is not quite so easy to apply as my Soap and Glory Supercat eyeliner it is certainly a close second, and achieving a cat eye/winged liner look is quick and easy. Overall if you're looking for a long lasting eyeliner to brighten up your make up I would highly recommend this! I am certainly going to have a look to see what other shade are available in this eyeliner!